The World Golf Hall of Fame IMAX Theater is known for its breathtaking 3D nature documentaries, but plenty of action-adventure movies are headed to IMAX in the coming months! 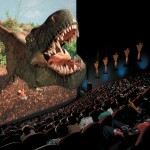 IMAX Theaters are designed to deliver the world’s most immersive movie experience. The 275-seat theater includes the latest IMAX 3D digital projection system, state-of-the-art sound system and North Florida’s largest IMAX screen (50 ft. wide and 80 ft. high). The theater also boasts large 2D screens with blockbuster movies and engaging documentaries. From super hero action films to family-friendly adventure movies, IMAX is the perfect place to take in a flick (without making the trek to Jacksonville or downtown St. Augustine). Free Solo(rated PG-13, 2D) – Thrill seekers and outdoor sports enthusiasts will love this documentary! We follow free soloist climber Alex Honnold as he prepares to achieve his lifelong dream of climbing the 3,200-ft. face of the world’s most famous rock: El Capitan in Yosemite National Park – without a rope! Click herefor showtimes and tickets. America’s Musical Journey: An IMAX 3D Experience (rated G, 3D) – Academy Award winner Morgan Freeman narrates this walk through the history and evolution of American music, celebrating the unique diversity of our country’s cultures and creative innovations that characterize America. Click herefor showtimes and tickets. Great Barrier Reef: An IMAX 3D Experience(rated G, 3D) – Narrated by Australian actor Eric Bana (Black Hawk Down, Hulk, Munich), this visually stunning documentary explores the world’s largest living wonder from the perspective of scientific visionaries, who are helping us to better understand and protect this precious resource. Click herefor showtimes and tickets. Pandas: An IMAX 3D Experience(rated G, 3D) – Get closer than you’ve ever been to Giant Pandas! This documentary unfolds at Chengdu Panda Base in China where scientists are dedicated to breeding Giant Pandas to introduce cubs into the wild. The film’s primary researcher utilizes a new technique inspired by a black bear program in rural New Hampshire. Click herefor showtimes and tickets. For more information, visit http://www.worldgolfimax.com/. The theater is located at One World Golf Place in the heart of World Golf Village (exit 323, International Golf Parkway).